This is amazing, I did not tiger actually had such great significance! I think it is important to save the tiger and do anything possible in that. The politicians will need to told that the tiger makes much of the GDP and needs to be protected. The tiger is the national animal of India…we must make sure it does not become ‘was’. And just like hockey…as a national sport, we ignore this animal likewise. 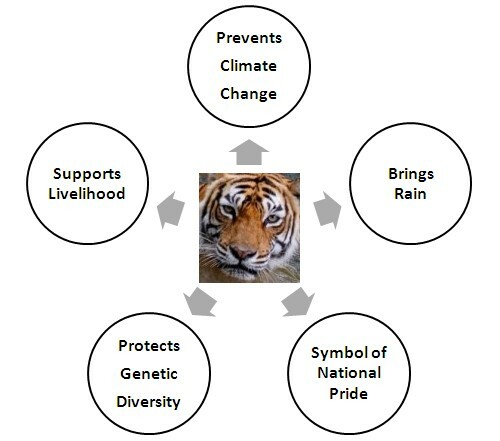 That is a wonderful piece of information.We must put in every possible effort to Save the Tiger.Is their any way that I can contribute to this noble cause? Not only tiger, we must care for all flora as well as fauna, these are the part of our life. good doing keep it up. We must put in every possible effort to Save the Tiger. The tiger is an animal on whom all of us’s survival depends, we must act to save the tiger. Its a lovely way to convey our purpose. Good Work Delhi Greens! We need you guys to help us to prevent the “buddha party” from colonising your future. I read this informative book called” The way of the tiger” by Ullas Karanth who headed the Project Tiger and continues to monitor some scientific projects to track tigers and study tiger behaviour in protected reserves. Though this book has a defensive tone about the efforts of Indian conservationists (inspite of failure of the “project tiger” ) this book takes on scientific approach in analyzing the issues involved in this business of saving tiger. He believes “science” is the only salvation of tigers apart from our own current actions. I believe public participation in form of rally will be an important eye opener politicians who only understand the lingo of votes. Read the article as well the comments. Personally I dnt think putting all the burden n blames to the authority is the way to show that we care. Our little bit will contribute a lot to this mission. I am trying to do my bit. Its very good social work doing by delhi greens to save our wild animals . really every human-being has to appreciate this……………………..
and one request before u kill tigers think once that it also has rights to live…………………………………… like human beings……………. To save the TIGERSis to save the NATURE & to save the nature is to save the LIFE & to save the life is to save the PRODUCTIVITY & to save the productivity is to save the biggest word in the world i.e THE MOTHER. Firstly, I disagree with the article that you released on what Jeremy Clarkson said about tigers. I find that he thinks that children would never want to see a tiger ever in their lifetime but in reality a lot of them want to see a tiger and other exotic animals that are becoming extinct. Also we would care if the tigers went extinct because they are majestic animals and we love seeing them but Jeremy doesn’t really care what other people think, he is just always going with his own opinion and none others which he should not do because it’s selfish. Secondly, I also disagree with him because he says tigers will still exist in Las Vegas and Asia’s back street big cat farms, the thing is that we do not want them to only exist there we want them to have their freedom and run wild. Poachers are killing them off quickly, we need to let them have their freedom but protect their habitat at the same time so no poachers go there. If the tigers are kept inside cages they will eventually get disheartened or agitated and try to escape. Do you think we all want to see tigers locked up in cages with no freedom? That’s right we do not, we want them to be free. Thirdly, I disagree with his statement saying that we will have to send international forces with the newest weapons and technology and get gunships to kill all the poachers. I know he is being sarcastic but it is a bit over the top to do that and anyway no one would ever do that. Fourthly, I also think that when he says that Chinese people believe that tiger parts will cure any virus or disease, not all Chinese people believe this he can’t really expect them all to believe these ancient beliefs. The truth is that tiger parts do not cure anything and we are killing tigers for nothing so all we need to do is spread the truth of these stupid ancient beliefs then we will have stopped a lot of the tiger poaching but not all of it. If we stopped this poaching everyone would stop talking about how tigers are becoming extinct and Jeremy can stop going on about how people are telling him that they are going extinct so he wouldn’t get annoyed so easily. In conclusion Jeremy Clarkson is incredibly selfish and is only telling everyone what he thinks not what the majority of people think even though it his article he should still include other people’s opinions. Before he expresses his views on this, he should also include an area where it only talks about what the majority of people think. He also is very inconsiderate because he doesn’t hardly care about anyone. I came forward to save tigers and give awareness to whole world. My first step of developed one mobile game the concept of save tiger it is play store. Kindly download and play it. The Download link is below. If you need I’m ready to give the game to you. So, you can take to the world. My next step of I’m going to create another game with more impact and realistic effect of 3D game for mobile platform. I’m going to create awareness all over the world. If you interested kindly support me. Looking forward for your reply.